Australia, 1985, 128 minutes, Colour. Brett Climo, Robert Coleby, Nicole Kidman, John Flaus, Tony Barry, Paul Bertram, Anna Maria Monticelli. Archer is a very entertaining telemovie, focused on the	the training of horses, the background of racing, international interests. This film, shows the winner of the first and second Melbourne Cups. The film is set in the 1860s - and is an attractive, imaginative story about what might have happened as trainer Dave Power rode Archer to Melbourne to win the Melbourne Cup. The film throws in many adventures: a remittance man, bushrangers, the Chinese from the goldfields, the mining towns and the double-dealing in races, farms and horse studs, battlers out in the bush trying to make ends meet. It all adds up to an interesting memoir of Australia in the 19th century - as well as a focus on a young man and his love for a horse, the qualities of a horse, racing. Brett Climo is pleasantly naive and shrewd as Dave Power. A group of Australian character actors fill out the supporting roles, relishing the opportunity for some character actors. The film was written by Anne Brooksbank (Maybe This Time, Newsfront, On Loan) and directed by TV writer Denny Lawrence (writer of Goodbye Paradise, director of Emoh Ruo). 1. An entertaining piece of Australiana? An evocation of the 19th century? 2. The telemovie and its style, the appeal to the home audience, Australian locations, the bush, the city? The period, lifestyle? The bush and the city? The pace? The rousing score? 3. The facts about Archer, the legend? The awe and aura of the Melbourne Cup? The Melbourne Cup and its origins? The ending - and the indicating that this is what should have happened (since we do not know what actually happened)? 4. Australia in the 1860s; the farms, the studs, the country towns, marriage celebrations, birth and death, the mining settlements, the workers, bushrangers, the police, the Chinese? Melbourne, the Melbourne Cup? 5. The film as a story of horses? Archer as a fine horse? Dave's working with Archer, loving Archer, the training and racing? The build-up of racing meetings in the 19th century? Competition, races, betting? 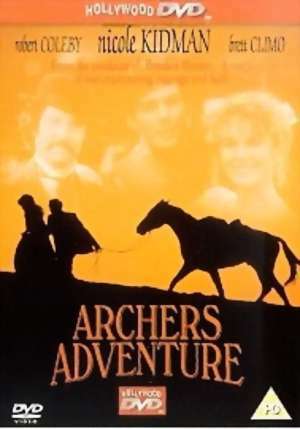 Archer and his strength, the journey, the strain, the encounter with the wild horses and his getting out of the stable? The attitudes of people to Archer, envy, greed, theft? The rivalry at the local races? Archer becoming a champion and part of history? Audience response to horses in films? 6. Dave as a fine young man, his numerous and poor family, their support, the silver coin? A good young man, love for horses? The clashes with the jockey? His working for Etienne, the training, the meals, with the hilarious workers and stable hands? His life and his hopes? His age? The hearing about the Melbourne Cup, the plea to Etienne to let him go, the preparations? The warnings about the dangers? Setting out, the initial encounter with Alfred, his helping him in the town at the bar, believing him, the ghost story? Camping out at night, his money being stolen? Alfred's warning note? The visit to the towns? The encounter with Catherine and her uncle, the uncle riding the horse, hospitality, missing Catherine, waltzing the horse through the bush, the changing terrain, the ruggedness, the snow, the storms and torrents? The homestead with Anna, her baby, the burial of the baby and his preparing the box for the coffin? His trying to help, his tender attitudes, Anna keeping vigil and resting? His wanting to find Matthew? Travelling out of his way to the mining settlement? The chance encounter with Matthew? The challenge to the race, his refusing, the decision to win for Anna and Matthew, the rigged race and his losing? His turning up for the marriage, the dance with Catherine, his enjoying himself? Archer's joining the wild horses, the ride to get Archer back, his to go into the corral? The bushrangers and the hold-up, the politicians, travelling with the Chinese from the mines? His shrewdness in disguising himself as a sheep and getting the police? Walking Archer to Melbourne, the support of Matthew, Melbourne and the rivalry with the jockey, his fall, his riding the horse to victory in the Melbourne Cup? The return, helping Anna, the happy encounter with Catherine? The fairytale nature of Dave's story? The range of adventures - and 'what should have happened'? 8. Alfred as the toff, the remittance man, his story about England, his money, his caution about bushrangers, the suspicion of the men in the bar? The talk and the tall story, the ghost story? Alfred travelling with Dave and talking? Robbing him? His letter of warning about trust? His turning up as a bushranger? The hold-up, holding the politicians? The police raid on the camp? His escape? And the irony of his standing at the Melbourne Cup beside the politician? 9. Catherine and her uncle? Her uncle as a good man, riding the horse, hospitality? Catherine and her sneering, attracted, helping? The dance? On the ride to round up the horses? Meeting Dave on his return? 10. Anna and her children, the blighted orchard, the dead baby, rocking the cradle, her being tired, helpless? Wanting her husband back? Dave's promise to her? His finding Matthew, talking with him, Matthew and his pride, the bet, the gold nugget? Matthew and his stances - attacking the politician about the plight of the people on the land? 11. The mining settlement, the men and their challenge, the rigging of the race and the heavyweight? 12. The bushrangers and their style? the hold-up, the politicians, the police? 13. The Chinese on the goldfields, Dave befriending them, their gratitude after getting away from the bushrangers? 14. The talk about the aborigines and the fearful stories about their attacks? 15. A pleasant and picturesque yarn?